Take Me: Home What is a Chemo Port? 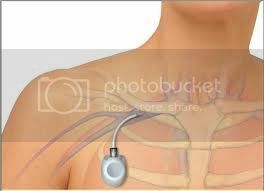 A chemotherapy port, sometimes referred to as a mediport, cancer port, or portacath, is a vascular access device that is implanted under the skin so that people with cancer can be given chemotherapy. A power port is a port that enables patients to receive IV therapy as well as contrast CT scans. Some WhatNexters have experienced a slight itching or burning when it comes time to have their port flushed. The time between flushes is often 3-6 weeks depending on recommendation from your doctor. There are possible complications with having a port. It should be monitored closely and you should report any problems to your doctor right away. A port can break, become swollen, or become infected; signs of infection are if the site is red, hot, or oozing. These problems are not meant to scare you, but are a reminder that you should be attentive to any changes and report them to your doctor. WhatNexters’ initial reaction when their doctor presents the option of a port is often one of uneasiness. Everyone will react differently, but some reject the idea of another surgery or worry that a port implant may be a constant reminder of their cancer. Fortunately, in most cases the uneasiness faded over time and they were thankful for their port. Even if you find you have a love/hate relationship with your port, many survivors say they would not change their decision and that it made going through chemotherapy more bearable. I had a port i had colon cancer 2015 wish i had never gotten it I'm still having pain in my neck it féel like the doctor left some of the port in my chest can't lift my arm you can feel something in my chest its not right i have chest pain i have not been right sense i got the port out in 2016 and now it's 2018 and im still having problems.